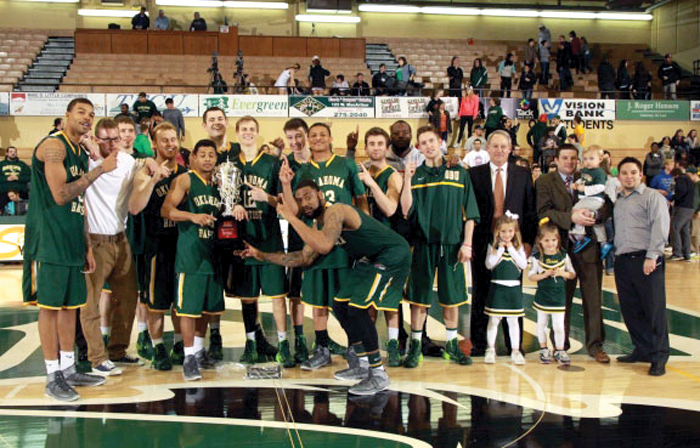 March 8 was a banner day for Oklahoma Baptist University (OBU) athletics. The Bison collected three NAIA national championship titles in women’s indoor track and men’s and women’s swimming and diving and Sooner Athletic Conference titles in men’s and women’s basketball. Here are the recaps from the successful day. 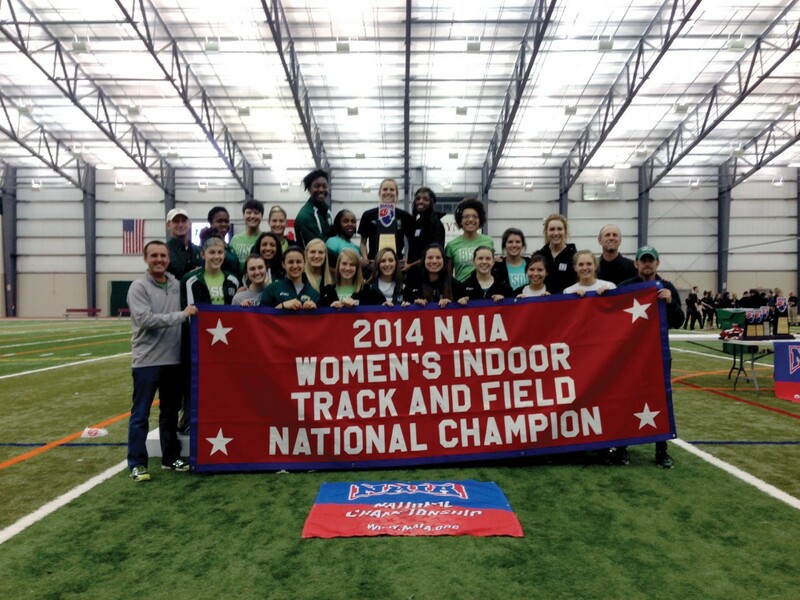 OBU successfully defended its NAIA Women’s Indoor Track and Field Championship, while the men’s team placed fourth in Geneva, Ohio. The Lady Bison scored 133 points and held off favorite Indiana Tech by 10. No other team was in the hunt. The OBU men scored 57 points for fourth place. The Indiana Tech men claimed the victory with 82 points, followed by Wayland Baptist at 69 and Concordia (Ore.,) with 57. Akela Jones earned Most Valuable Athlete honors. The sophomore racked up 58 points alone, winning titles in the pentathlon, long jump, 60-meter hurdles (8.31) and high jump (5-10). She set a total of five NAIA National Championship meet records on the way to her second-straight Most Valuable Performer honors. Behind Jones’ four titles and two by Jura Levy, the OBU women racked up at least six individual titles for the third-straight year. Levy won her third-consecutive championship in both the 200 meters (23.59) and the 60 meters (7.35). Jones and Levy become the first OBU competitors with six career championships, and join just six previous NAIA participants who have racked up at least six in their careers. Levy came up big in her two wins, holding off a field comprised mostly of Indiana Tech rivals to give OBU the 10 points in each race. Jones was second in the 60 meters at 7.52 for a little more cushion in that race. Hannah Helker also claimed a pair of titles, gutting out the 5,000 meters in 17:18.36 and the 1,000 meters in 2:46.91. Kati Grandstaff was sixth in the 1,000 at 2:55.96, making for another important event. Taylor Moore came up big in the 600 meters, taking second at 1:30.73. Stacy Warrior placed third in the 400 meters at 54.87 seconds and Halie Herbert placed seventh in the 800 at 2:15.57. OBU defended both national titles at the 2014 Men’s and Women’s Swimming & Diving National Championships at the Oklahoma City Community College Natatorium. 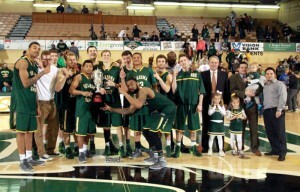 The men have won three straight championships since the program’s start in 2012, while the women are repeat champions after finishing runners-up in 2012. 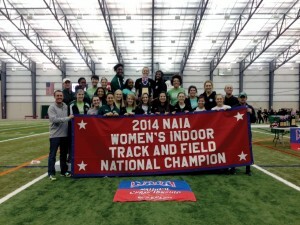 OBU claimed six more individual championships Saturday, setting five new NAIA records in the process. Ines Remersaro won the first title for OBU on the night, taking the Women’s 200-Yard Backstroke in 2:01.10. Junior Laura Galarza defended her title in the 100-Yard Freestyle, finishing in a record-setting 49.97. Daniel Ramirez won his third national championship of the meet with another record-breaking performance in the 100-Yard Freestyle. He finished in 42.53, shaving nearly a full second off his own record. Ramirez was named Men’s Swimmer of the Meet after setting three new records. The Men’s 200-Yard Breaststroke featured another NAIA record, as Gregory Penny finished with a finals time of 1:59.03. The team of Galarza, Lisa MacManus, Andrea Antonissen and Remersaro claimed the Women’s 400-Yard Freestyle Relay title in record time at 3:25.01. Ramirez, Daniel Robbins, Logan Lassley and Tim Richard took the Men’s 400-Yard Freestyle Relay in 2:56.71, also setting a new NAIA mark. 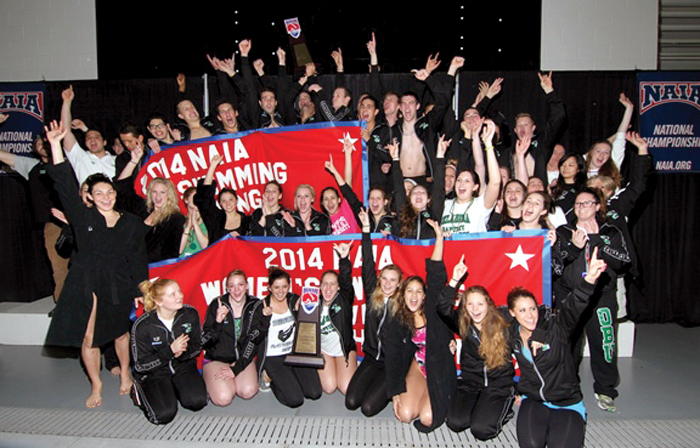 OBU set 11 new records during the week and defended titles in eight relay events. MacManus was named Women’s Swimmer of the Meet at the conclusion of the championships. Bison divers Kristen Brimage and Jarod Haynes were named NAIA Divers of the Year. 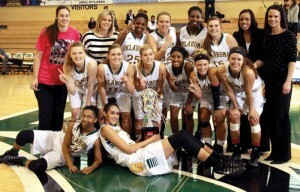 After going 15-15 for the regular season, the only route to a 14th consecutive trip to Kansas City and the NAIA National Basketball Tournament for the Bison was through a victory in the Sooner Athletic Conference championship game. OBU successfully navigated that course, knocking off Wayland Baptist (WBU) 70-69, for its fourth win in as many nights. The path looked bleak with 4:53 left in the game as the Bison fell behind 67-57 and WBU had the ball. Kendall Parks got a s teal, and Aaron Abram put back a shot to start the comeback. After an offensive foul by WBU, Tyler Davis scored inside to make it a 67-59 contest with 3:45 to go and the Bison faithful began to believe. A WBU miss and a Hayden Darst rebound led to a Cale Jackson free throw to inch OBU closer. Parks rebounded a three-point Pioneer miss and Darst scored on the other end with a nice feed from Eric Stubbs, knocking the lead down to 67-64 with 1:58 left. After a WBU turnover, Darst was fouled and sank both ends of the bonus free throw to make it 67-66 with 1:12 to go. OBU forced another turnover and Abram delivered the lead with 47 seconds to play. OBU caused yet another turnover and Darst made two more charity shots with 12 seconds to play to complete the 13-0 run for a 70-67 lead. Darst, the tournament MVP, led the Bison with 20 points, followed by Jackson with 16, Abram with 15 and Stubbs with 10. Stubbs got a double-double with 10 rebounds. Monroe led the Pioneers with 27 points and Royal Crouch added 16. Darst was joined on the All-Tournament team by Hustle Award winner Jackson, Abram, Monroe, Crouch, WBU’s Barry Johnson and USAO’s Tyler Reynolds. 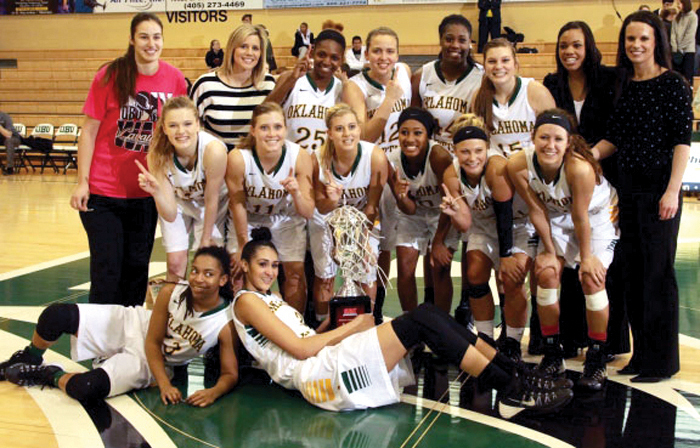 Oklahoma Baptist women’s basketball team claimed the first Sooner Athletic Conference Tournament Championship in program history Saturday night, defeating John Brown (Ark.) 60-57 at the Noble Complex. The No. 6-ranked Lady Bison (28-5) received an automatic bid to the NAIA Women’s Basketball National Championship in Frankfort, Ky. with the win. OBU trailed 23-27 at intermission after shooting just 33.3 percent in the first half. The Lady Bison lead reached nine points in the second half before the Golden Eagles tied the game at 57-57 with 1:33 remaining following a pair of made free throws from Kortni Barenberg. Jalissa Council scored with 1:07 left in the game to give OBU a two-point lead. Elisabeth Daniels split a pair of free throws with one second remaining for the final score of the game. Junior Charity Fowler led the Lady Bison with 18 points. The Asher native was named SAC Tournament MVP after averaging 22.7 points, 9.3 rebounds, 4.7 assists, and 2.0 steals over three games. 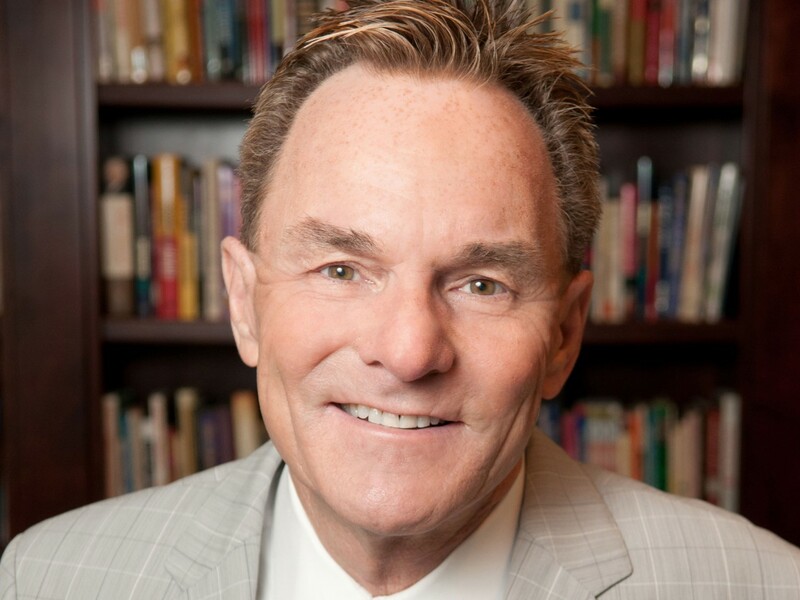 Arkansas pastor Dr. Ronnie Floyd talks about his vision for the Southern Baptist Convention.